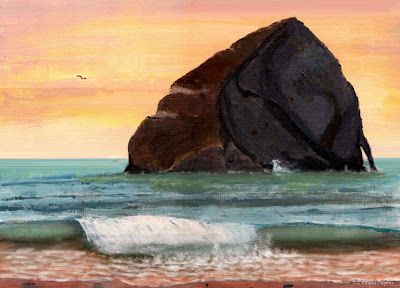 This was a simple acrylic painting of Haystack Rock at Cape Kiwanda. This is the larger of the two rocks named 'Haystack' in Oregon, and allegedly the second largest monolith in the world. I always liked the colors found in this painting. There are other things I'm not happy with, but the color was wonderful. This painting was sold immediately. However, I preserved the essence of this work of art in a low cost poster and a framed print. I'm reading: Haystack Rock at Cape Kiwanda (Acrylic)Tweet this! I first time visit in this post. I find this post is useful and valuable.